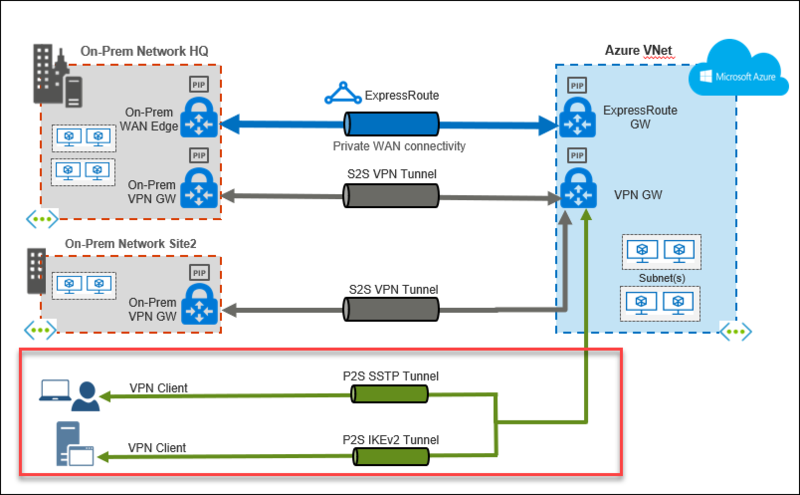 Azure’s Point-to-Site (P2S) VPN gateway connection creates a secure connection to an Azure virtual network’s (VNet) resources from an individual client computer. A VPN gateway is created on its own subnet in an Azure VNet, and then configured to allow P2S connections. No VPN physical device is required and there are minimal, if any, changes required to be made to the on-prem network. A P2S VPN connection is established by starting it from the client computer. It is possible to also route a P2S VPN through a secure Azure VPN Gateway – but the software VPN Gateway is within the Azure subscription, not in the on-prem network. A P2S solution is useful for connecting to Azure VNets from a remote location or when there are only a few clients that need to access an Azure VNet’s resources. We use a P2S connection as a proof-of-concept (POC) for a .Net Web App hosted within an Azure VM webserver to be able to connect to an on-prem Sql Database. The following cmdlets and process flow is from an excellent article in Azure Documentation, Configure a Point-to-Site connection to a VNet using native Azure certificate authentication: PowerShell with detailed explanations for each of the following steps – we’ve just put it all together in an easy to follow list of PowerShell cmdlets to run sequentially in an elevated Windows PowerShell ISE session, to quickly set up a P2S Gateway – after changing the variables for each use case. There is also an ARM Quickstart Template Point-to-Site Gateway that will quickly provision a P2S Gateway on Azure for you covering Steps 2 – 7 below! The most current version of Resource Manager PowerShell cmdlets installed. Installation info here. Login-AzureRmAccount Get-AzureRmSubscription Select-AzureRmSubscription -SubscriptionName "<subscriptionname>"
$VNetName = "VNet2" $FESubName = "FrontEnd" $GWSubName = "GatewaySubnet" $VNetPrefix1 = "192.168.0.0/16" $FESubPrefix = "192.168.1.0/24" $GWSubPrefix = "192.168.200.0/27" $VPNClientAddressPool = "172.16.201.0/24" $RG = "VNet2-RG"$Location = "Canada Central" $GWName = "VNet2GW" $GWIPName = "VNet2GW-PIP"
$RG = "VNet2-RG"$Location = "Canada Central"
This can take up to 45 minutes according to documentation. For us, its never taken more than 15 minutes. New-AzureRmVirtualNetworkGateway -Name $GWName -ResourceGroupName $RG -Location $Location ` -IpConfigurations $ipconf -GatewayType Vpn ` -VpnType RouteBased -EnableBgp $false -GatewaySku VpnGw1 ` -VpnClientProtocol "IkeV2"
This is done after the VPN Gateway has been created – and before trying to upload an exported root certificate for authentication. Thank you Stefan…I’ve fixed that in the code now.